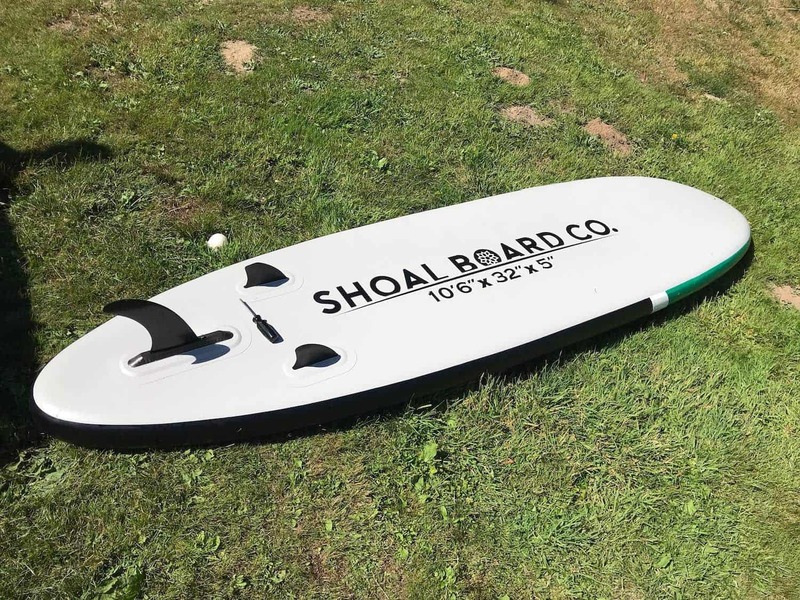 I was really excited when Eddie from Shoal Board Company reached out and asked if I would like to be one of the first to review their new all-around inflatable paddle board. I felt honored and excited to share a new product with everyone. I have heard random things about inflatables in the past from some of our reviews, so I look forward to see if Shoal can address some of my past concerns. Well, I’m happy to say they hit everything (although we will have to find out in time about durability). We will get into the details here shortly. I have to say it is kind of nice to get a board in a smaller package as opposed to a massive box or two when it is a solid sup. The box isn’t any lighter, but at least it isn’t 13’+ long :-). As you will see in the video above, everything came so nicely packed and was very presentable. At no point did I get an idea or feeling of cheap. Everything was very nice and thought out. The really nice touch was the free aluminum water bottle as I wasn’t expecting that at all. Free unexpected gifts are always awesome! Now I am not sure free bottle will come in all orders as I think it is a special for the month of July (just so people understand). Let take a look at the specs of everything first before we go into detail about everything that comes in this kit…. Pump: Bravo Double Action Pump. 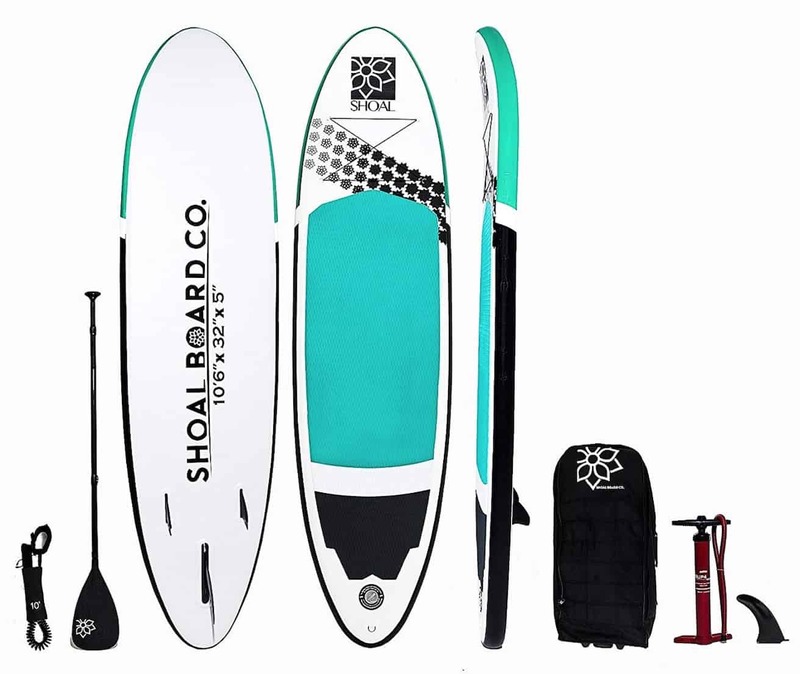 What Is The Shoal SUP Made Of? 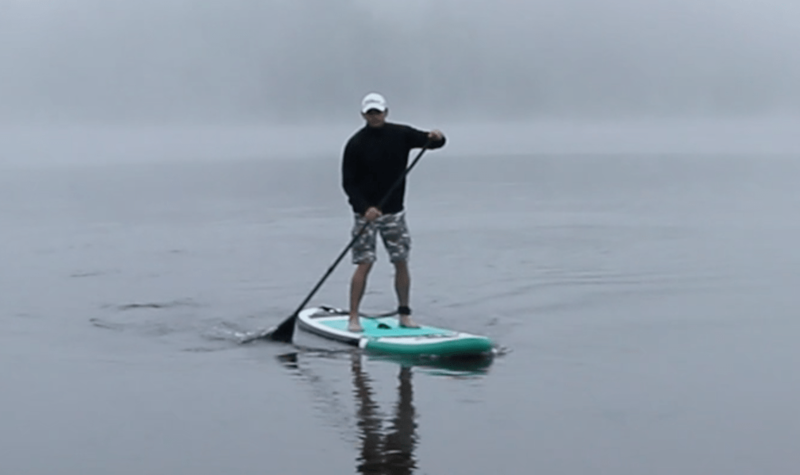 It seems to be common place that inflatable paddle boards (ISUP) are made typically from a military grade PVC drop stitch core. Well this one has a military grade double layer laminated PVC core. I also can’t remember off hand if most ISUP’s all have double layered side rails, but this one does so that is a bonus as the rails tend to rub against everything and anything. Needless to say, this should be pretty durable than, but only time will tell there. All we can do is take our best guess for the next year or so. I will update this blog as more time passes. “I love the carbon fiber paddle!” I was so excited to try it. As for the board, I liked the color scheme and the deck pad felt great. Once it was inflated I was impressed how they get these boards to be so rigid and keep their form so well. I was honestly excited to just get out and ride it. I really like the color (that is just my personal preference) The designs are simple and clean and the Shoal logo is nice. I personally like a clean board so I like a smaller logo, but that is just my taste, to each their own. As you can see right on the bottom of the board (picture) there is no guessing the size of this board, 10’6″ x 32″ x 5″. 10’6″ is a nice normal length for and all-around board, not too long and not too short. Very simple design with a round nose and just a little bit of nose rocker so any small chop passes under the board instead of going over it. This has the tri-finn setup which really helps it track straight rather than just having one single 10″ fin like a lot of boards do. How Does The Deck Pad Feel? Awesome…thats it, just awesome. Super soft and comfy on the feet. Comfortable if you are kneeling on it as well. I would consider this a good pad for a yoga board personally. This is not just my opinion, but my dads and girlfriends as well when they tried it after getting off of a solid SUP with a little firmer pad on it. Everyone liked it. You know, inflatables have good points and downsides for me. The good side is that you can fit it into any car. You can pack it on a hike or travel with it. The downsides are that it takes time to unpack, setup, and air up (I timed airing this up at a moderate pump pace and it took me 4 minutes and 54 seconds to get it inflated to 20 psi). You have to pack extra stuff to inflate it and then store that stuff somewhere if you hiked down to a lake. I know, this sounds petty, but I’m honestly just helping you think about things before you make a purchase decision. Hard boards have their downfalls as well, especially if you own a small car….where are you going to put that thing?! Which is why an inflatable would be good for a small car owner. There are good and bad to both. Back to the board…After airing it up I am always surprised how stiff these things get! It is amazing and I always feel like I might pop it, but it never does…lol. I feels a little heavier (I’d guess 28-30 lbs?) I couldn’t find any specs on that and didn’t see any anywhere so don’t write that in stone as I didn’t actually weigh it. I’m guessing maybe the double layer drop stitch core added a little weight, but I’ll take it for durability. Once on the board in the water I was excited. The leash feels comfortable and great around the ankle and the pad feels soft on the feet and the board is VERY stable. If you fall off of this, maybe paddle boarding isn’t for you! This was just me saying this, my girlfriend doesn’t like all my other paddle boards but she loves this one and my dad as well. He said that it just felt more stable than any of my other boards. This is nice to know because it was his first time out ever paddle boarding so it was great info to pass on. This is a great all-around and beginner board for sure. Once up and paddling i could get good speed and keep a straight line quite easily (tri-finns help!). I love the light weight carbon paddle but it was almost too good. If I paddled really hard and aggressively, the paddle would slightly waiver back and forth in the water because it has a very smooth face on it compared to my Bravo paddle that I use a lot the has a V-grove down the middle of the face to prevent jostling or movement back and forth in the water when you paddle hard. I think maybe if this had the same face design as my Bravo paddle and was still carbon fiber, it would be the absolute ultimate paddle ever! Seriously, I just love this thing even though it moves a little in the water under hard paddling. The board itself is great and I could paddle around on this thing all day long. 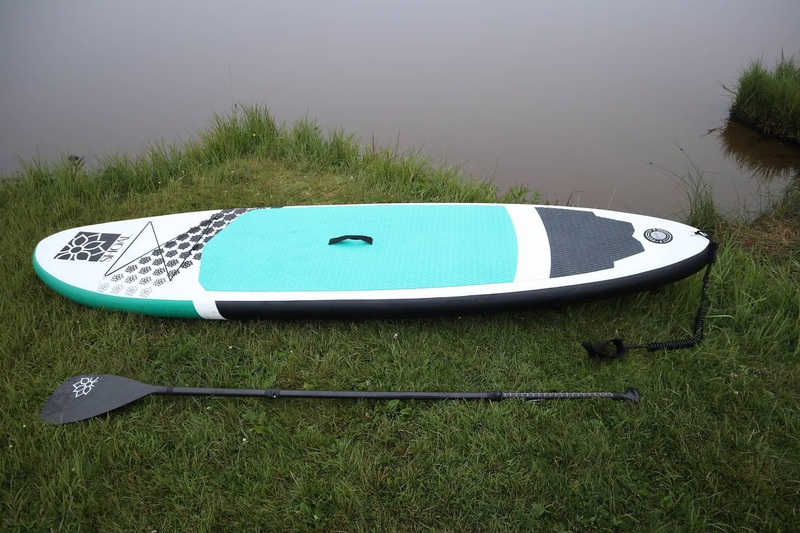 I would say that it would be great for a yoga SUP because of the stability, soft pad, and deck area. I might even be good for fishing, although there is only one tie down area in the front and it isn’t the greatest, so maybe not. The tie down area is more to stuff a flotation device under or a bag/ backpack. there are only 2 light cross straps on it and this is probably an area that could be improved, but this board is for fun, I wouldn’t consider it a touring board where you would need better tie downs for gear. 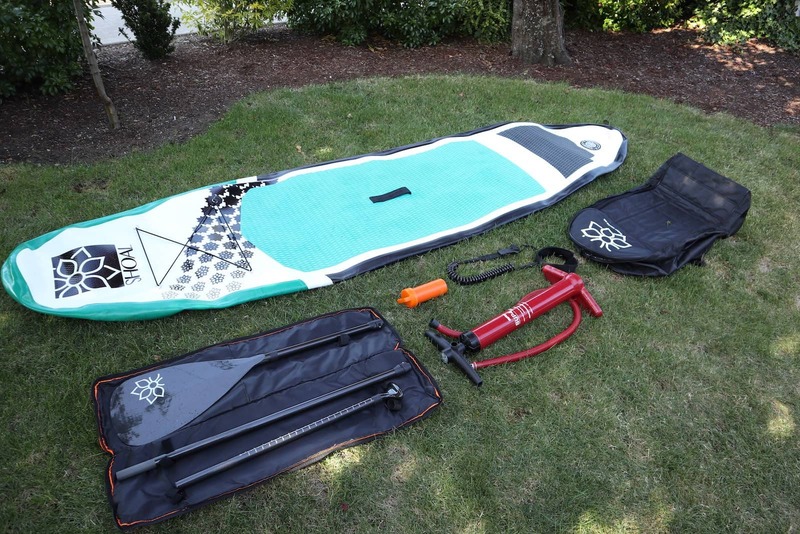 Is This Inflatable Board Kit Fast? To me, I don’t buy an inflatable for speed, that just doesn’t make sense. But is it fast for an inflatable? Sure, I could move around quite quickly with this especially with the ultra light paddle. I would have to guess that since most inflatables use the same materials that they will all be about equal in speed. The only factors the would play in is surface area (width and length) making one slower or faster than the other. This is not as fast as say a Tahoe SUP touring board, but it moved well enough that I wouldn’t complain. 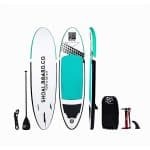 Man this is a great board package if you want an inflatable paddle board that can fit into a car or for a hiking and you want good quality and a decent price. This is also great for beginners and it comes complete with everything anyone really needs to have a good time out on the water. It is said to have a 300 lb weight capacity (although I don’t see anything in writing on that) so that should suit a lot of people. Well worth the money in my opinion. I would think of this as a lake and river board or maybe a calmer ocean setting. I wouldn’t take this in big surf or whitewater as I just don’t see it as that kind of paddle board. This is a really great package and really great board for a solid price. I’ll keep things updated as far as durability goes as I use it more in the months to come and I WILL BE USING IT! It is just a really fun board and that is what it is all about for me in the end. If you have a board you would like us to review, please email or contact us to get more information. As always, thank you for taking the time to read our reviews and be sure to comment and ask any questions you have below in the chat!